Following the success of the Port | South alliance over the past 2 seasons we will continue this with U13, U14 and U15 boys squads and U14 girls squad in 2018. The following has been endorsed by the committees of both South Melbourne Districts Football Club and Port Melbourne Colts Junior Football Club. PLEASE REGISTER ASAP FOR 2019! Purpose of this memorandum of understanding is to outline the expectations of each club as we field combined age level squads in U13 boys, U14 boys, U14 girls and U15 boys season 2018. We encourage all players and parents from each club to understand and endorse the philosophy behind combined teams. The guiding principle will be to ensure that both clubs culture is preserved, and squads will be co–branded, sharing home games and a combined Port / South jumper reflecting both club’s colours. All combined teams are to be officially known as Port-South Melbourne. 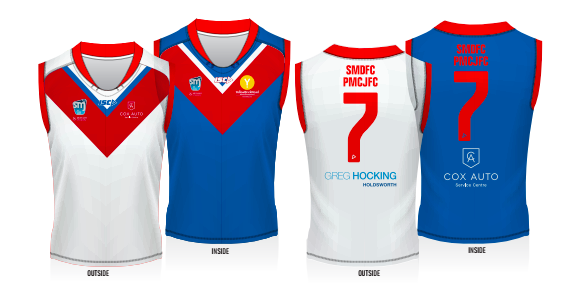 Our jumper represents the combined colours of South Melbourne Districts Football Club and Port Melbourne Colts Junior Football Club. It is reversible so when a clash occurs the jumper can be readily modified. This means only one jumper is required for weekly matches and will avoid past confusion amongst players re which jumper to wear to matches. We thank Greg Hocking Holdsworth, Cox Auto and Yellow Brick Road mutual sponsors of both clubs, for their commitment to sponsoring the Port / South combined jumper for 2018. Coaches and team managers will ensure this is the only song that players sing after a win to ensure the culture moving forward is inclusive of both clubs. Teams will play their ‘home & away’ games at the home grounds of both clubs based on each club’s representation. For example, if one club has 30% representation in an age level, then each team in that age level is to play 30% of their ‘home & away’ games at that club’s home ground. The number of games is to be rounded to the nearest whole number and exact halves are to be round up where the club’s percentage representation is below 50%. Training venues are largely dependent on the availability of coaches and grounds. Training venues will need to be co-ordinated on an age level basis each year and it is generally agreed that where possible venues will reflect the representation of each club within each age group. Team photos will be taken in the combined club uniform. Both club logos will be represented on photo. Presentation night venue will largely be dependent on the availability of facilities. Presentation nights will be co-ordinated on an age level basis each year and it is generally agreed that where possible venues will reflect the representation of each club within each age group. Players are to register with their home club and registrations will be transferred to the combined squad by the administration personnel from both clubs. One of the most difficult tasks for a junior football club with more than one team in the same age group is allocating players in teams in a way that satisfies all stakeholders. Port Melbourne Colts | South Melbourne Districts Junior Football Clubs endeavour to carry out the task according to the guidelines set out below, in accordance with the vision of both Clubs to provide our junior players a game of football every week and the best possible opportunity to develop to the best of their ability in a fun and safe environment. At the U13 / U14 / U15 age levels, teams play in a highly competitive competition where a greater emphasis is placed upon individual and team performances. In these age groups we strive to have at least one team participating at the highest level (division) possible. Teams are graded to enable them to be as competitive as possible in their respective division. As a result, grading may require player movement from their previous team. Where player selection to a different team occurs, it should be regarded as an opportunity to experience diversity, improve skills and they should be encouraged to adapt and enjoy change. As there are two teams in each age group, team selection will be based on providing players with the best possible opportunity to develop to the best of their ability, commensurate to their level of fitness, skill set and physicality. Attendance and attitude at training sessions will also influence selection and those attending training sessions will receive preferential consideration to those players who do not attend training. Players not training and or arriving late for training and match day may disadvantage their eligibility for selection or match time quota. This approach is also consistent with the AFLs Junior Match Policy and the SMJFLs competition structure. Our clubs have endorsed our Coaches to place a high emphasis on team rules and player behaviour at training. Coaches team rules and discipline expectations are to be respected and met at all times by players and parents. We expect all players to be respectful to coaches, parent helpers and teammates at training and games. Should a player/s be sanctioned for disciplinary action, penalties will be decided by the team Coach and the Football Operations Age Group Coordinator. Our U13 / U14 / U15 teams will operate throughout the season as a squad - warm up and cool down at training will be conducted as a squad, selected teams will break off to conduct specific drills/skills for 45 minutes. The only occasion we operate as a team is on a Sunday at matches. Teams will be announced via a squad e-mail by Friday of each week. There will be regular occasions throughout the season where we will require flexibility in player selection, particularly in rounds where a number of players from a particular team are unavailable; and to provide players in a lower division team with the opportunity and incentive to strive to play in a higher division team/ player in a higher division team with the opportunity and incentive to regain form/touch by playing in a lower division team. The above will be communicated to players prior to training. Where player selection to a different team occurs, it should be regarded as an opportunity to experience diversity, improve skills and they should be encouraged to adapt and enjoy change. Please note that if a player is promoted up/or down they will be provided with a minimum of 2 weeks in that respective team. The club also needs to adhere to the SMJFL Player Movement & Finals Qualification Policy. We will invite all registered players to a TeamStuff Pre-Season Squad to advise the changing locations. Thursday 5 - 6.30pm, Aanenson Oval. Wednesday 18 Apr + beyond from 6 - 7.30pm, Aanenson Oval. We manage all our squad, team, club, game, player availability through the TeamStuff application which can be viewed on computer, tablet or smartphone. You will be invited to join TeamStuff by the yet to be appointed Team Manager. You are automatically registered at time of registration to weekly newsletters from both clubs.